Tofu Chickpea Stir Fry with Tahini Sauce. On one of the rare evenings when we actually had 10-20 minutes to devote to cooking, this recipe was a winner. So easy and healthy! The key is baking the tofu ahead of time (I did it the night before). This is the only way I will eat tofu from now on. The only “weird” ingredient is the tahini, but thankfully we already had some in the fridge from when Wes attempted to make homemade hummus a few months back. In typical lazy form, I omitted the onion and pepper because I didn’t want to take the time to go buy them. I threw in some garlic to make up for it. Art of Oil balsamic vinegars. My entire family has a love affair with Art of Oil in Boone, NC. I could probably spend hours in the store sampling all of the different flavors of olive oil and vinegar. I am a huge balsamic lover, and by that I mean that I enjoy drinking it straight from the bottle (yes, I’m a freak). Mixing the vinegars with a little EVOO makes for a perfect homemade salad dressing without all the nasty preservatives and other scary ingredients. Lately, I’ve been dabbling with the vinegars in my cooking as well. 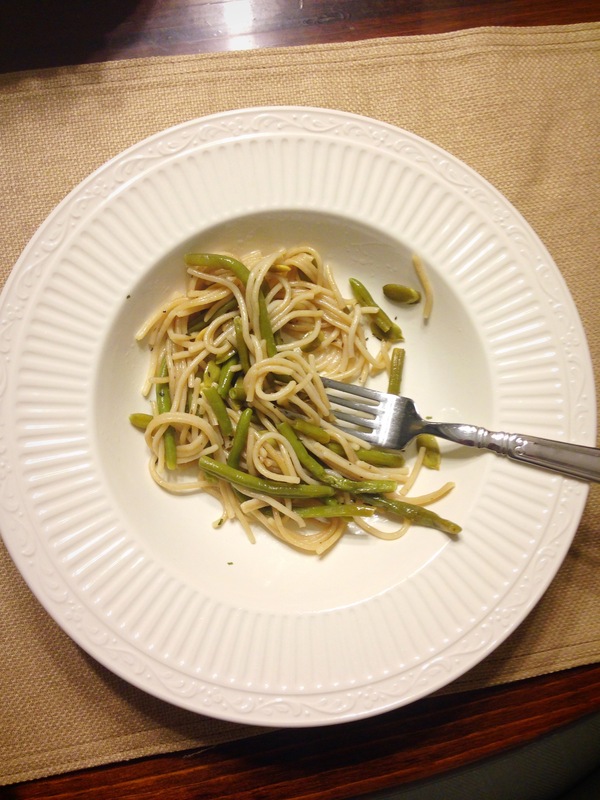 This week, I used the Pumpkin Spice White Balsamic Vinegar in a green bean and pumpkin seed pasta that I took to work for lunch. Perfect fall flavor! Raw Honey. I’ve been reading a lot lately about the health benefits of raw honey, so this month I bought some and started taking a small spoonful with my breakfast each morning. I stopped taking my allergy medication about 6 days ago and while I haven’t been dying, I’m still a little itchy and sneezy. I just bought some local raw honey from the neighborhood farmer’s market today and can’t wait to try it out! Hoping it will help ease some of my allergy symptoms. Enjoy Life Gingerbread Spice Cookies. I’m jumping the gun a little bit on Christmas cookie season, but these are too good for me to care. I was already in love with the Enjoy Life Snickerdoodle version, so these were an easy sell for me. Homemade Pizzas. Easy and yummy. We make separate pizzas since I need gluten-free crust (and because Wes likes his pizza SPICY). He buys ready-to-bake dough at the local Kroger or Whole Foods deli counter, and I typically use a pre-made gluten free crust sold by our local farmer’s market food truck. My mom just gave me a GF pizza crust mix that I’m dying to try out next time, though! I like to top my homemade pizzas with lots of spinach to up the health factor. 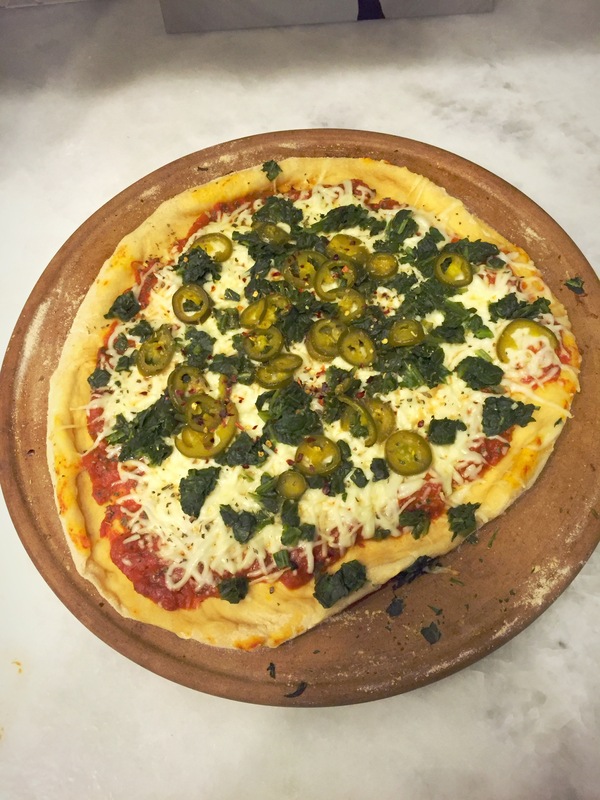 Don’t mind the lopsided shape of our pizza crust in the photo below…we aren’t professional dough stretchers just yet. What recipes are y’all loving lately? Send me some easy peasy ones!